Episodes 325-348, may contain spoilers. A quick look at the DVD cover will reveal that this collection of One Piece is very special, as at last we see the debut of the final (at the time of writing) member of the Straw Hat Pirates. However, we don’t see him right away. Following the conclusion of the “Water Seven” arc, the collection begins not with Monkey D. Luffy and his crew, but with his older brother Portgas D. Ace, who has tracked down Marshall D. Teach, aka Blackbeard. 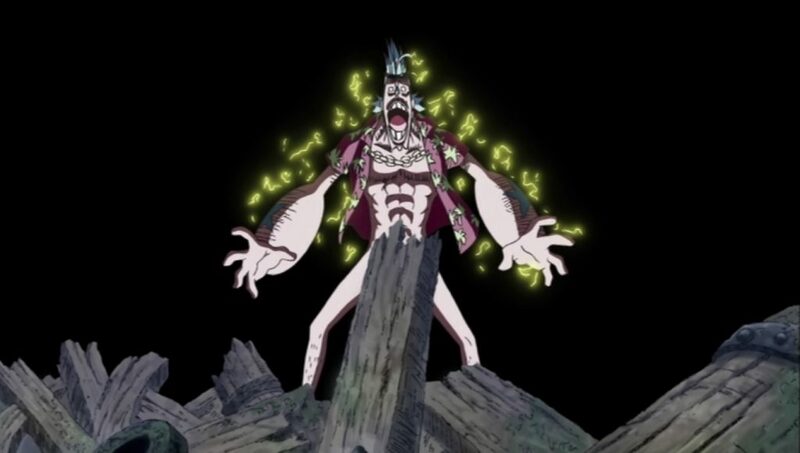 Blackbeard, a former member of the Whitebeard pirates of which Ace is also a member, is now wanted for murdering another Whitebeard pirate and stealing a Devil Fruit: the Dark-Dark Fruit that allows him to control gravity. Thus a battle between his crushing powers and Ace’s control of fire begins. But this is just one episode. After this, and perhaps not surprisingly following the massive “Water Seven” arc that preceded it, there is a “filler” arc. Here, the Straw Hats find what appear to be an abandoned group of fishermen who were attacked by a group of pirates. They go to help, with Chopper tending to one member of the ship’s crew who is on the verge of death. It is discovered that this is not a crew of fishermen, but the “Phoenix Pirates” who have suffered the greatest of humiliations: having their Jolly Roger flag stolen. The man being tended to by Chopper happens to be their despondent captain, Puzzle the Phoenix. The Phoenix crew try to poison the Straw Hats, but they easily spot the trick and the Phoenix pirates tell them all that has happened. Then, what appears to be a group of marines arrives. Fortunately, new crewmate Franky is able to use the modifications on the Thousand Sunny to help both crews escape, such as turning the ship into a super-fast cola-powered paddle boat. Unfortunately, it turns out that the marines are fake, and the pirates find themselves in an arctic region governed by a family of bounty hunters, the Accino family. The head of the family, Don Accino, likes to collect pirate flags and is responsible for the theft of Puzzle’s flag. The family then steals the Straw Hat’s flag, meaning that the rest of the crew have to try and get it back before Luffy finds out. After this escapade (and a one-episode filler of spoof superhero “Chopperman”), the Straw Hats find themselves on the move again, and spot a barrel that is supposedly offering food and drink to the god of the sea. Luffy opens it to reveal the barrel is empty, except for a flare that is fired. The crew then find themselves blown into the dangerous and perpetually-dark Florian Triangle. Here they encounter an old, wrecked ship, which has only one resident on it: a rather pervy skeleton with a huge afro, singing to himself. Luffy, Sanji and Nami climb on board to investigate, and Luffy is so impressed by him he instantly offers the skeleton the chance to join his crew, which the skeleton, named Brook, appears to accept. Brook tells his story, about how the crew for whom he was a musician were attacked by a much stronger force, but he survived by eating the Revive-Revive Fruit, which allowed his soul to return to the living world. But as the Florian Triangle is so dark, it took a year for his soul to find his body, by which time all that survived were his bones and hairdo. Brook also reveals that actually, he cannot join the crew, because someone has stolen his shadow. He can only live in the dark Florian Triangle, because if he is touched by sunlight he will be destroyed. Luffy decides to help Brook find his shadow again. However, the Straw Hats find that the boat has somehow arrived on an island, which Brook knows to be the ghost island Thriller Bark. Brook leaves the rest to try and find his shadow on his own, while Nami, Usopp and Chopper venture out first, onto an island that is full of ghosts and zombies. There Chopper learns to that the island is reportedly the home of Dr. Hogback, the greatest doctor in the world, but they eventually learn that his experiments have a dark purpose. Concerning the first arc in this collection, it is not that bad as far as filler stories go. The main entertainment comes from the rest of the crew desperately trying to prevent Luffy from realising that their flag has been nicked because of all the problems that would follow caused by him. Thus you end up with action and fight scenes being mixed in with some rather farcical comedy. On the downside, neither the Phoenix Pirates or the Accino Family are really that remarkable. Out of the Phoenix Pirates, the best one that comes across is the cabin boy Jiro, the only member of the crew that seemingly hasn’t given up on finding the flag again. Meanwhile, in the Accino Family, Don Accino has a Devil Fruit power, but his Hot-Hot Fruit which allows him to raise his body temperature to up to 10,000 degrees feels too similar to Ace’s Flame-Flame Fruit. In the Thriller Bark arc, the main point of interest is Brook. With him now in the show, it feels as if we have made a big development. The whole unit is finally here. Although, it has to be said he doesn’t appear that much in the first part of the arc. It mainly features the regular Straw Hats venturing onto Thriller Bark and battling the evil monsters on the island. These range from a zombie that Luffy attacks by simply pushing it back into his grave; ghosts that cause anyone they pass through to feel instantly depressed; and a gigantic bridezilla boar-zombie who tries to attack Nami whom she sees as a rival for the zombie she loves – but Nami gets out of it by claiming to be a crossdressing man. One other detail of note is of cultural differences. The main fights the Straw Hats have on Thriller Bark are with these zombie creatures, but rather than in the west where they are killed by going for the head, they are instead frightened by fire. Thus all the really successful attacks are coming from cowardly Usopp using his “Exploding Stars”. In this collection there are extras including episode commentaries, interviews with Luci Christian (English voice for Nami) and Stephanie Young (English voice for Nico Robin), and the really long textless openings – as there are no endings except for a “To Be Continued” caption and details of the next episode. Among these openings include a new one, “Jungle P” by 5050. The race to save Ace is on, as his captain Whitebeard declares war on the Navy’s home turf. There are many stories about breaking out of jail. This is about breaking into it. As the Paramount War concludes, will Luffy be able to save Ace?